Worsted weight yarn I used 10 colors and it worked out to roughly 7oz of each color. Now some of these are Vanna’s choice and they don’t come in 7oz so you’ll need two to get the amount. Also gauge and tension will affect it… so you might want to look through the blanket and add a little. 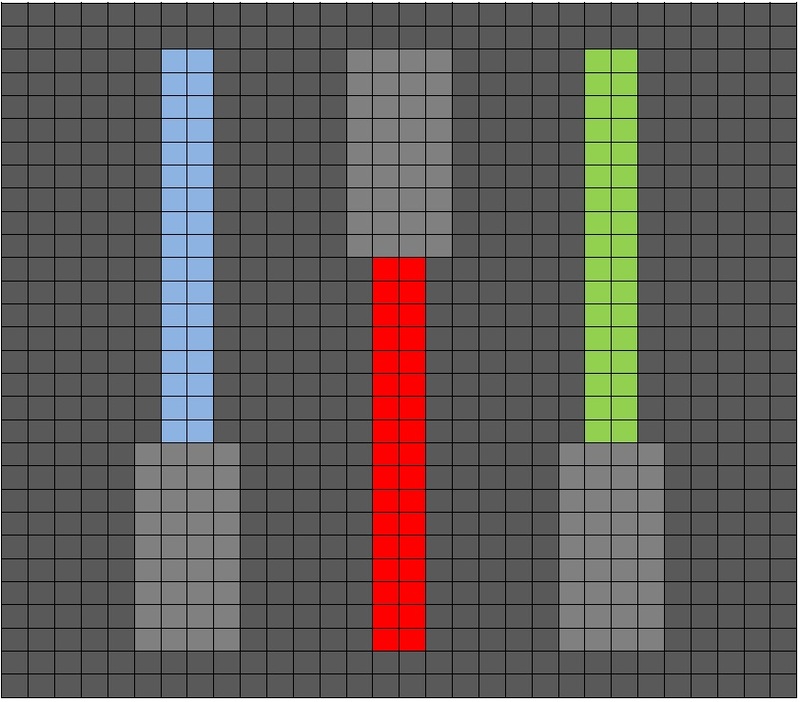 For instance you have 4 navy squares, 4 light blue squares, 4 black squares… maybe get two of those. Unfortunately a lot of this was stash yarn for me so I’m guessing a bit at the amount. 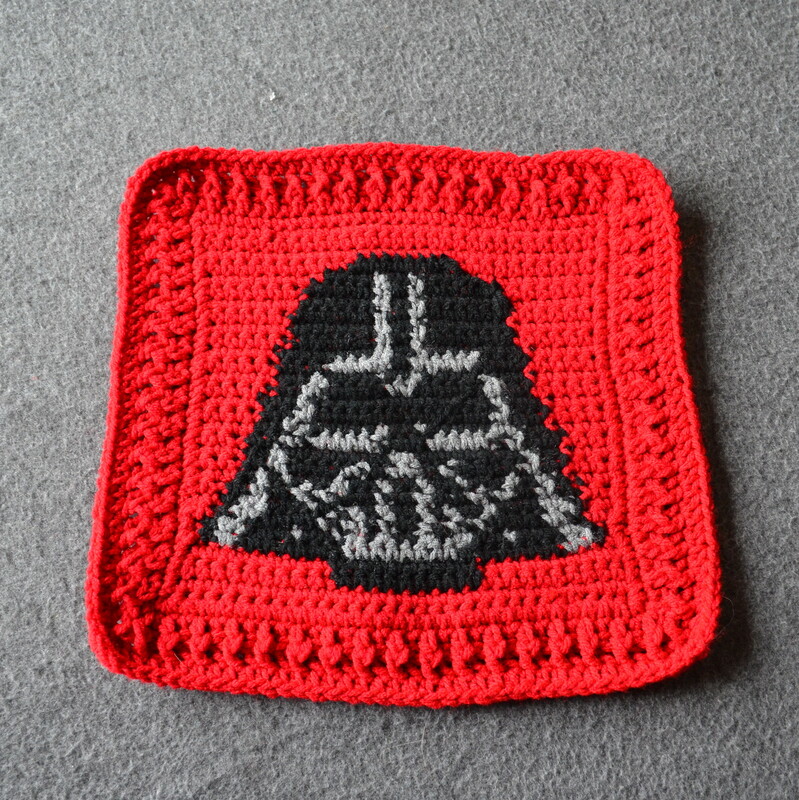 Maybe err on the side of caution on the bigger colors and use your scraps for something awesome like a Death Star pillow! 🙂 I hope that helps… sorry to be vague! I could just kick myself as this is the one thing I didn’t keep good track of through this process and of course the most asked question! 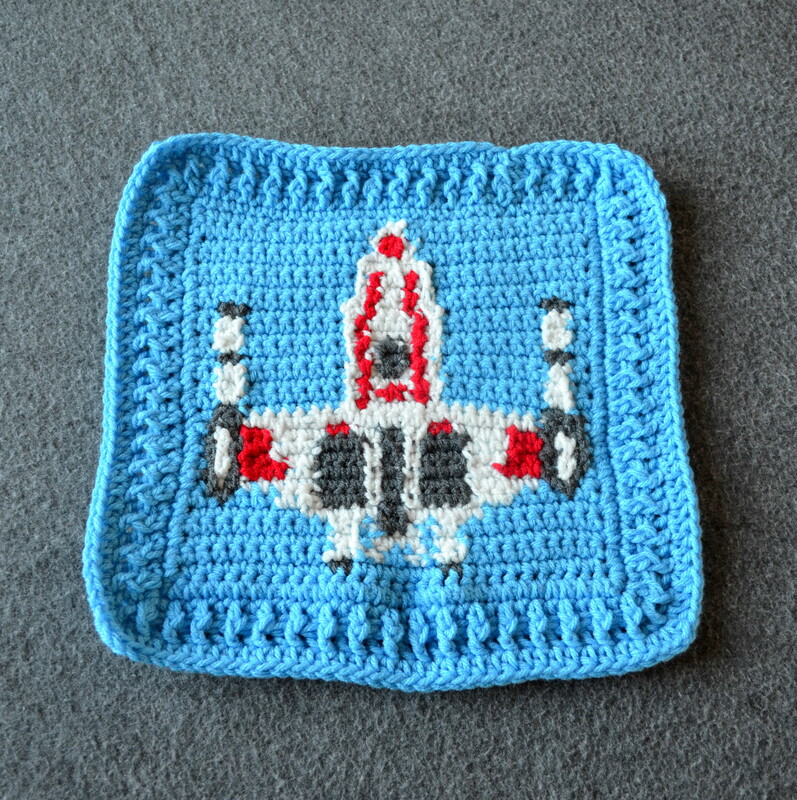 Each graph, both those from the following site and my originals, are 30×30 squares done in single crochet. I personally carry my colors behind and drop them as I finish each section. This set of five videos is a very good set of tutorials for graphing if you want to see it done. 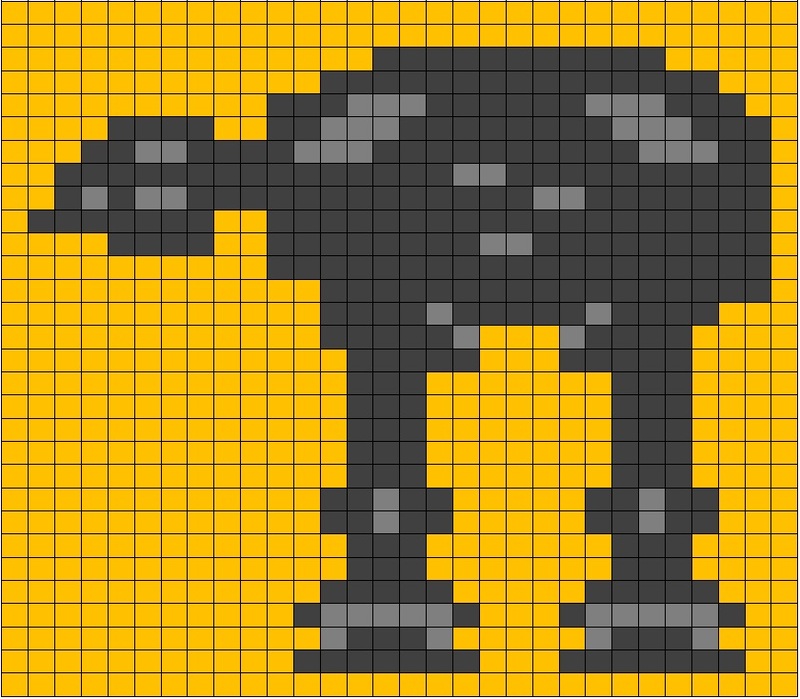 From the following link I am using: Death Star, Stormtrooper, Y-wing, Old Rebublic Logo, R2-D2, Tie Fighter, Millinium Falcon, Boba Fet, Empire’s Insignia, C3P0, Scout Trooper, Rebel Insignia, Jengo Fett and the Incomplete Death Star. 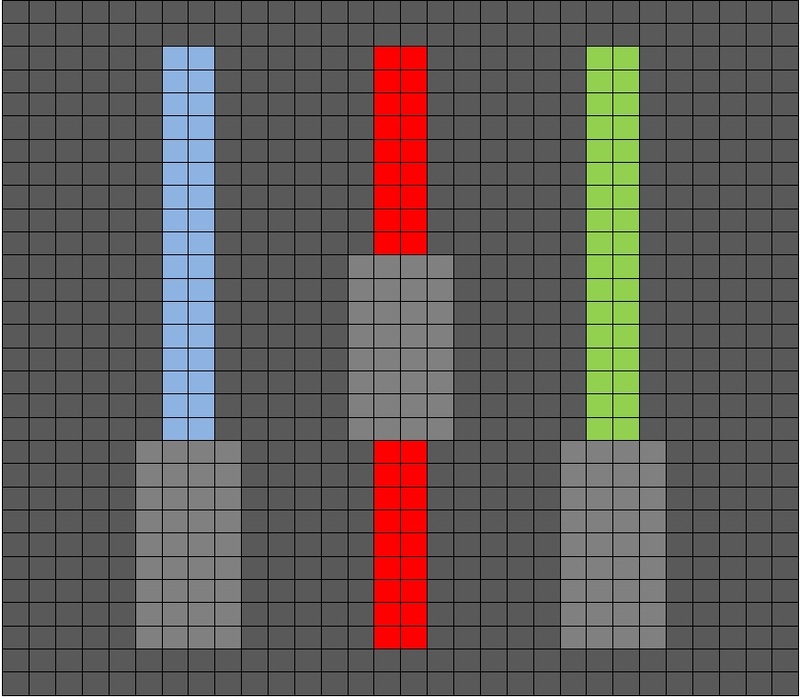 These are the square that I made with the above graphs. 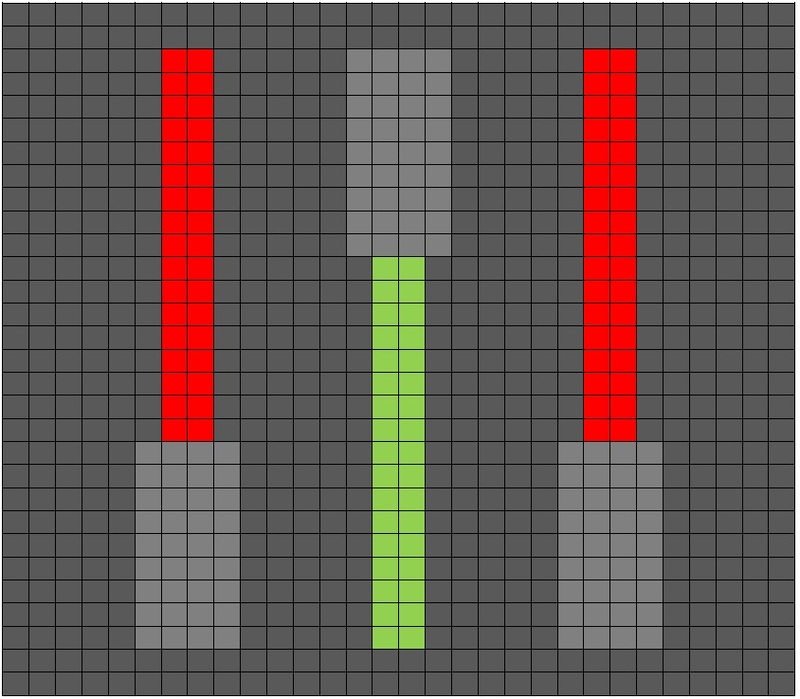 Without further ado… here are my own original graphs! Feel free to use them to make your own works of art! Colors are suggested based on a series that we all know and love but have fun with it! I would love to see what you make! 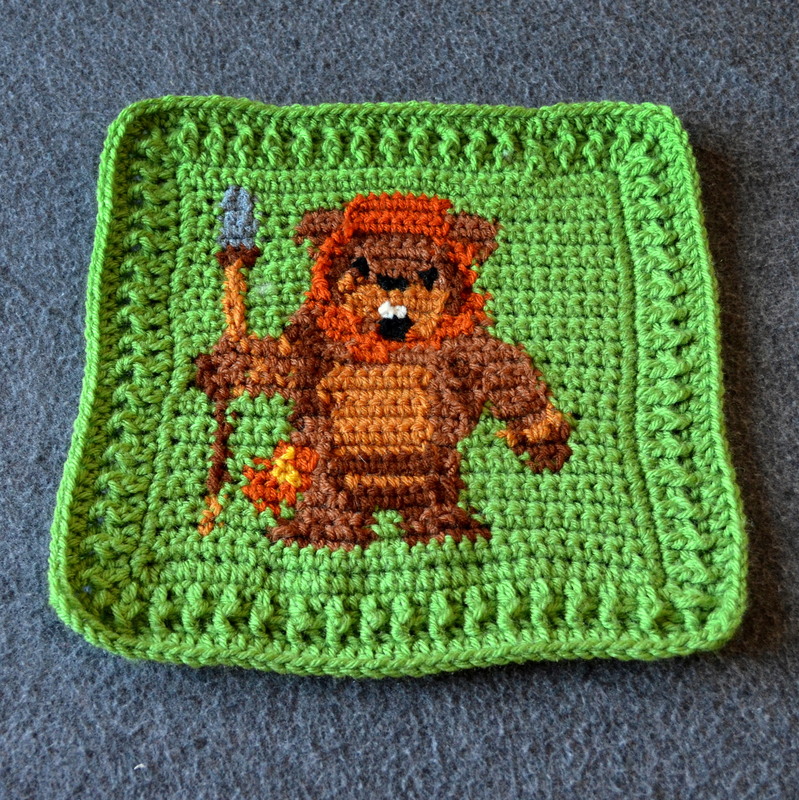 I’m pairing the 30×30 graphs with my pictures of the actual crocheted squares. In order to save and print these graphs, just right click and choose ‘save picture as’ then save and print! I personally print the graphs so that I can mark my lines with a pencil on completion. When you have finished each square, tie off and weave in all of your ends. Mark what will be the front of your work. 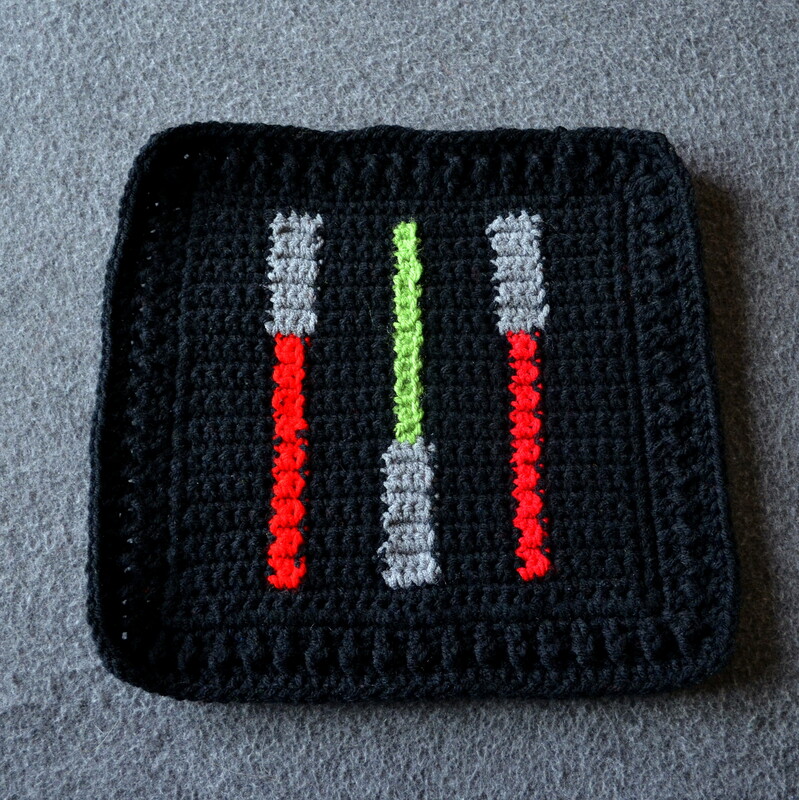 Round 1: Using the main color for each square, join in any stitch with a standing single chain. Single chain in each stitch around with a third single chain in each corner. Join with a slip stitch to the top of your standing single chain. Round 2: Chain 2 (or a standing half double chain) and work a half double crochet in each stitch around, working 3 hdc in each corner stitch. Join with a slip stitch to the top of your chain 2. Round 3: Chain 3 (or a standing double chain) and front post double crochet in the next stitch. Back post double crochet in the next stitch. *around. Join with a slip stitch to the top of your chain 3. Round 4: Chain 2 (or a standing half double chain) and half double crochet in each stitch around again working three hdc in each corner stitch. Finish off and weave in your ends. Round 1: Work a row of single crochet around the entire edge of your blanket. In the joins between each square work a s2tg to ensure a nice smooth edge for your blanket. 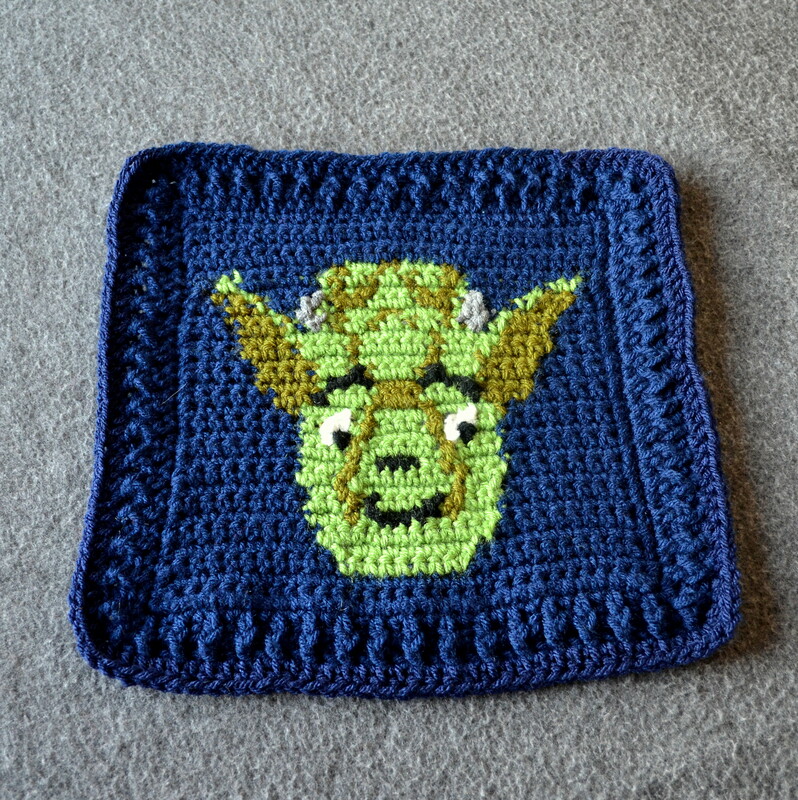 http://www.crochetme.com/glossary/single-crochet-two-together-sc2tog.aspx Round 2: I delight in using the Giant Granny Patches Border to edge this blanket. I feel that it just sets the whole tone and brings all of the bold colors together. 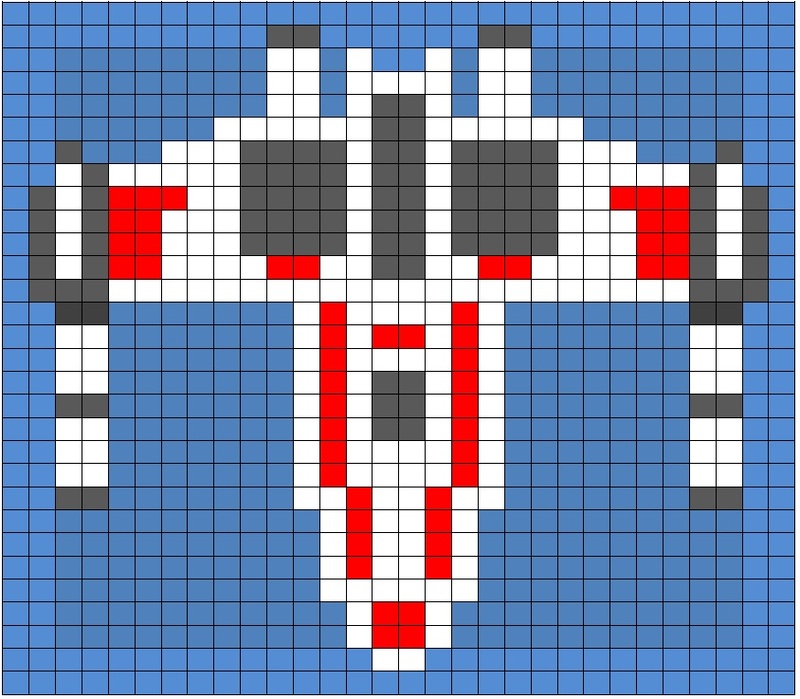 I start with Round 4 of the pattern and continue out until I’m happy with how it looks! 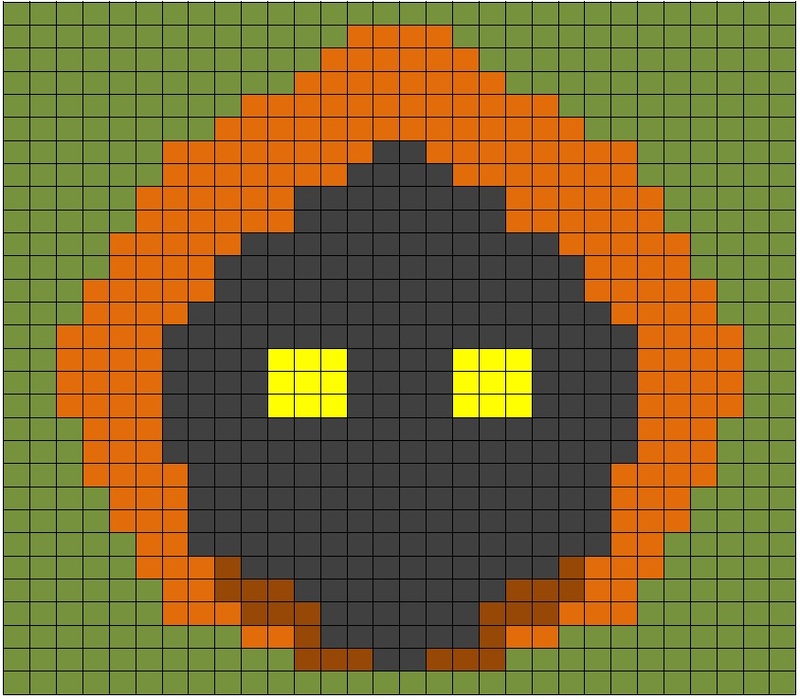 Courtney – Thank you SO MUCH for all your efforts in bringing this terrific pattern to us all and for free, too. I’m blown away! Thank you for bringing that to my attention! (embarrassing! LOL) It is corrected! This is awesome! 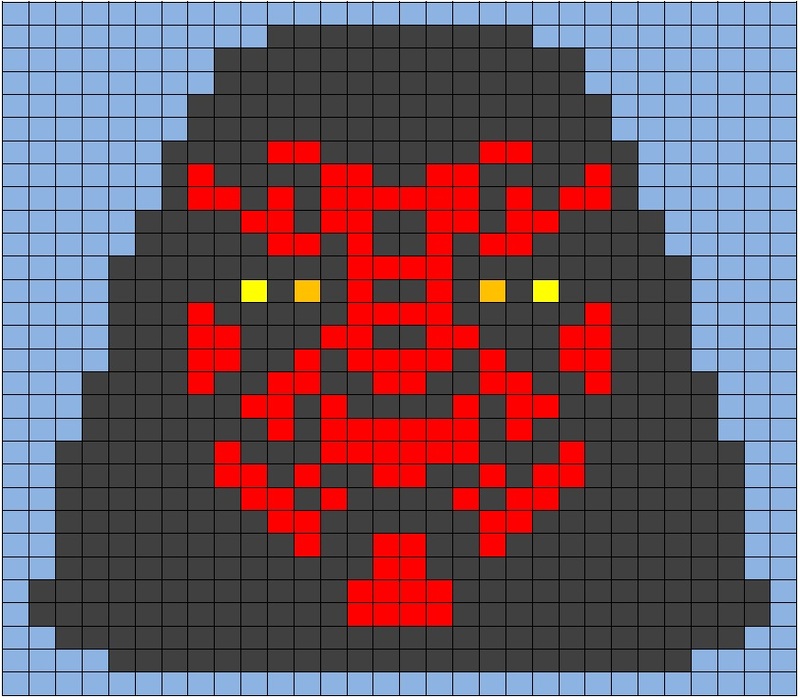 However, the graph you have for Darth Vader is actually the Darth Maul graph. Whoops! I fixed it for you! Sorry for the snafu… I was working on it feverishly for about 5 hours yesterday to try and be done before I had to leave and must have forgotten a final go through! Wow ~ love this!! Would it be possible to get a list of the colors you used? Thank you! Thank you Lori! I have updated this post with a full list of the colors I used! I hope it helps!!! My goodness!!!! Nothing but problems in this post… Okay I went and corrected the link… still didn’t work… did it again… still didn’t work! I eventually gave up and just linked to her Ravelry store and that does work! Who knows? I love this blanket! 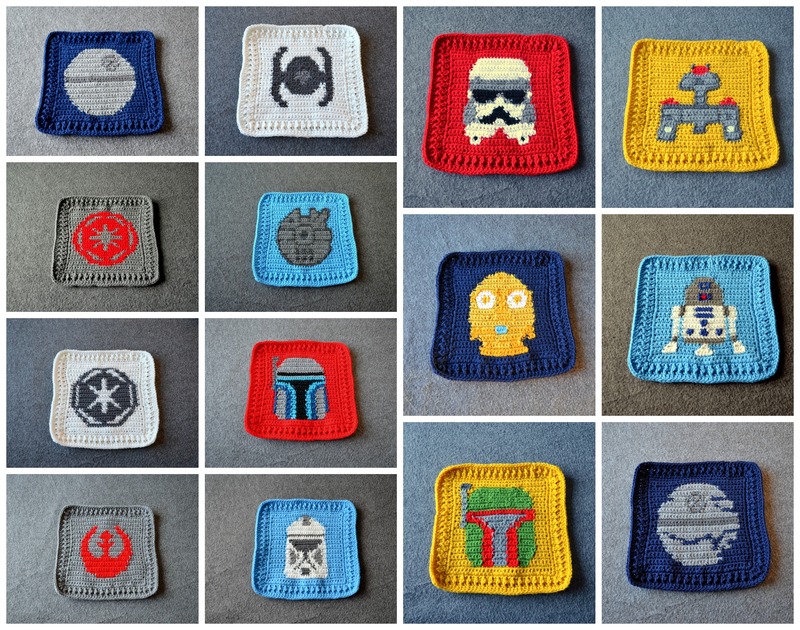 My sons are BIG Star Wars fans and my mom is going to make one for each of them! I am trying to order the exact yarn online and a skein of yarn doesn’t say they are 17 oz … from what I am understanding 17 oz of yarn is roughly 3 skeins? Do I really need 3 skeins of yarn of each color to make a blanket? or am I totally doing this wrong? Lori is right ONE 7oz skein of each color. Now some of these are Vanna’s choice and they don’t come in 7oz so you’ll need two to get the amount. Also gauge and tension will affect it… so you might want to look through the blanket and add a little. 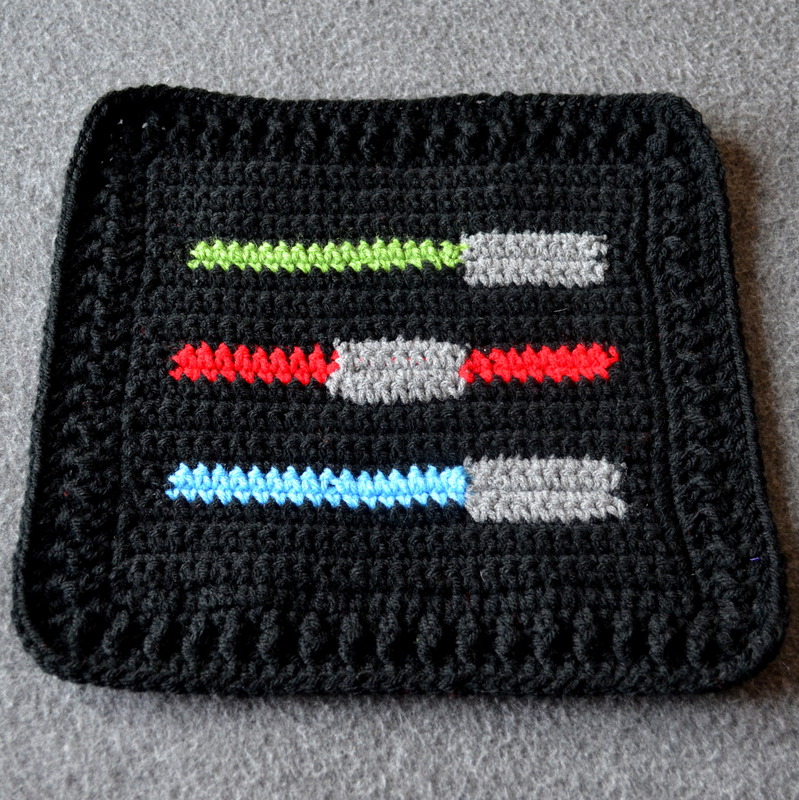 For instance you have 4 navy squares, 4 light blue squares, 4 black squares… maybe get two of those. Unfortunately a lot of this was stash yarn for me so I’m guessing a bit at the amount. 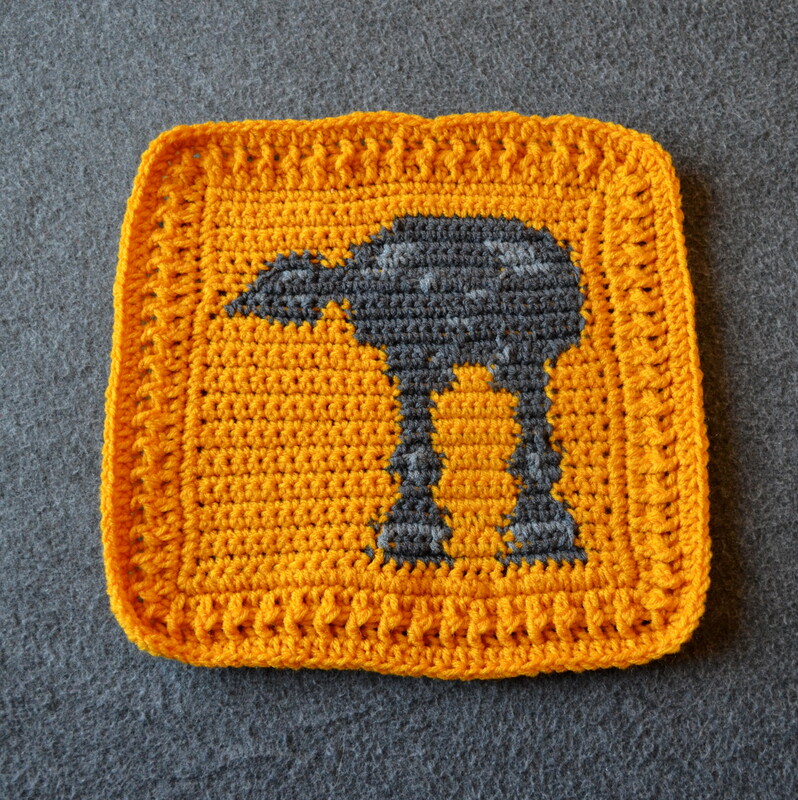 Maybe err on the side of caution on the bigger colors and use your scraps for something awesome like a Death Star pillow! 🙂 I hope that helps… sorry to be vague! I could just kick myself as this is the one thing I didn’t keep good track of through this process and of course the most asked question! I shopped for my yarn today and I actually found a few very similar colors in Red Heart, instead of Vanna’s or Bernat etc……………I kind of customized mine a little I guess so the colors won’t all match perfectly, but it will still look awesome! I am so excited to get started! I told my mom I will just guesstimate on these amounts and since she is making 2 blankets I will get enough for one for sure and let me know what she has left before ordering for the second one. I found Amazon has a great deal on these exact colors and free shipping. the only one I couldn’t really get was the graphite. but Vanna has a heather grey that I think will work. if that helps anyone looking for these exact colors. I’m so sorry for my late reply, I was out of town… I apologize, but that is one thing I did not keep track of the colors specifically. They should be fairly easy to work out but I will absolutely help if I can. Unfortunately I don’t have the blanket anymore! 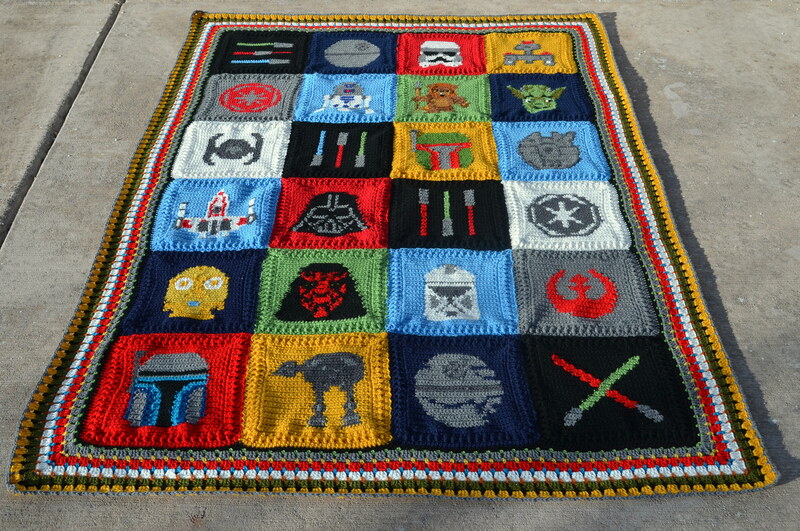 Hello, what a fabulous blanket. 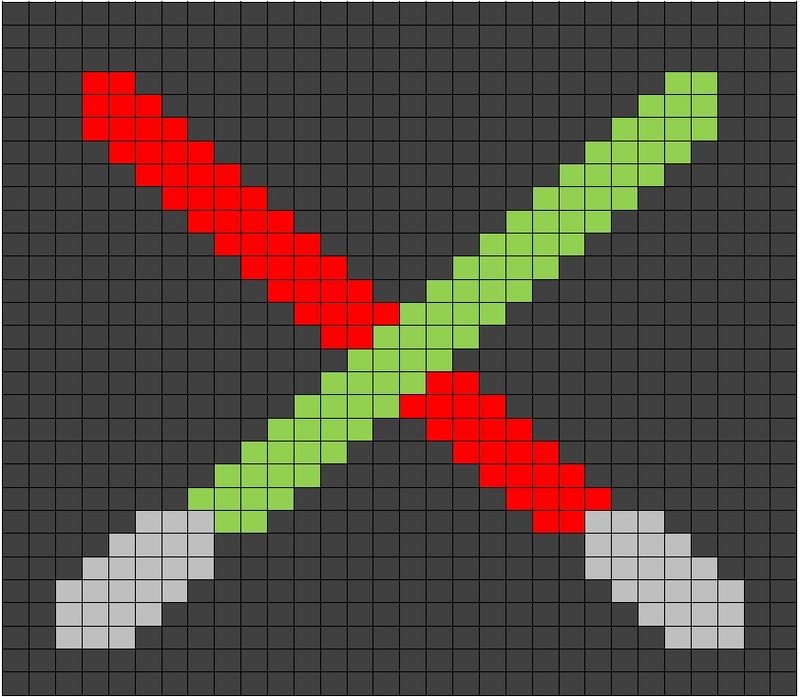 I am in the process of knitting it using your graphs. 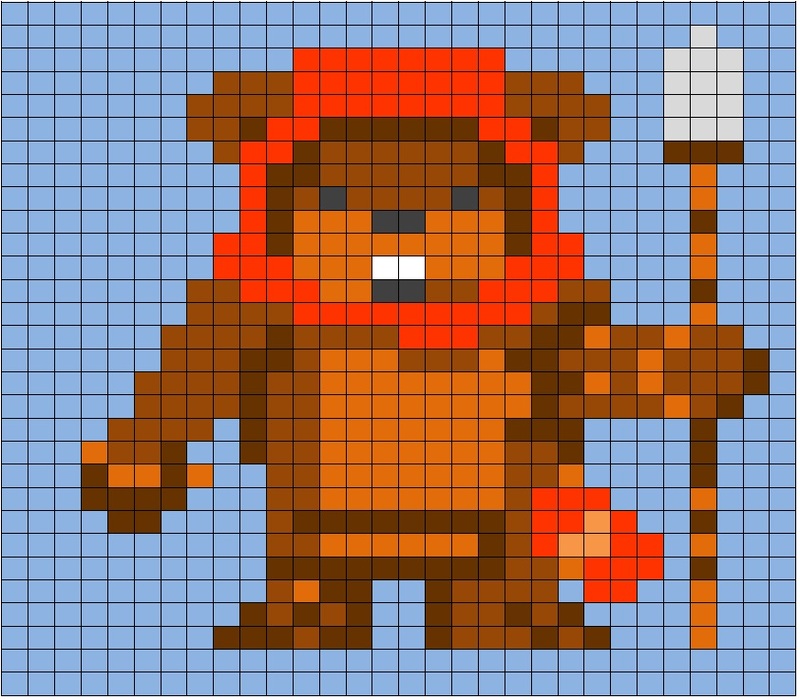 However, one graph I would like is Chewbacca. I have a picture and just wanted to know if it is really hard to convert to a graph – any link to instructions would be really appreciated. I have not been successful in finding how to do it. Thank you so very much for this pattern! I am a ROCK STAR in the eyes of my 7 year old twin boys 🙂 They want to learn how to crochet! Makes a mama’s heart proud. I was wondering if you had the Star Wars logo graphed out? Or if you know of anyone who does?? Thank you so much for sharing this awesome creation! 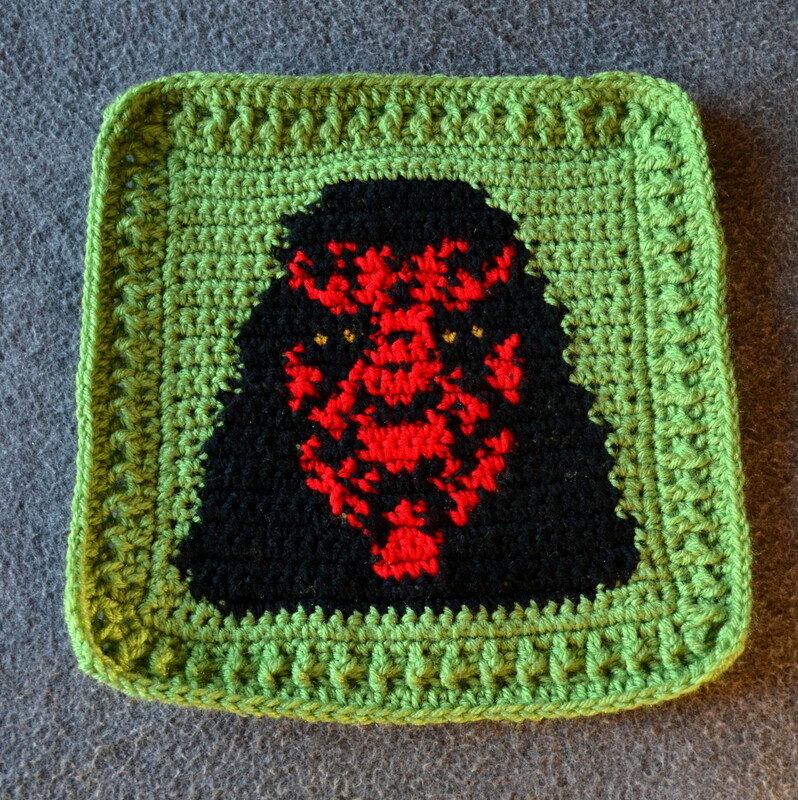 I can’t wait to attempt it for my own little Star Wars fan! He will love it! Hi, I was wondering how you got such clean lines and symmetry on your color changes? Even the video tutorial you linked to comments that you get slight imperfections with color changes. 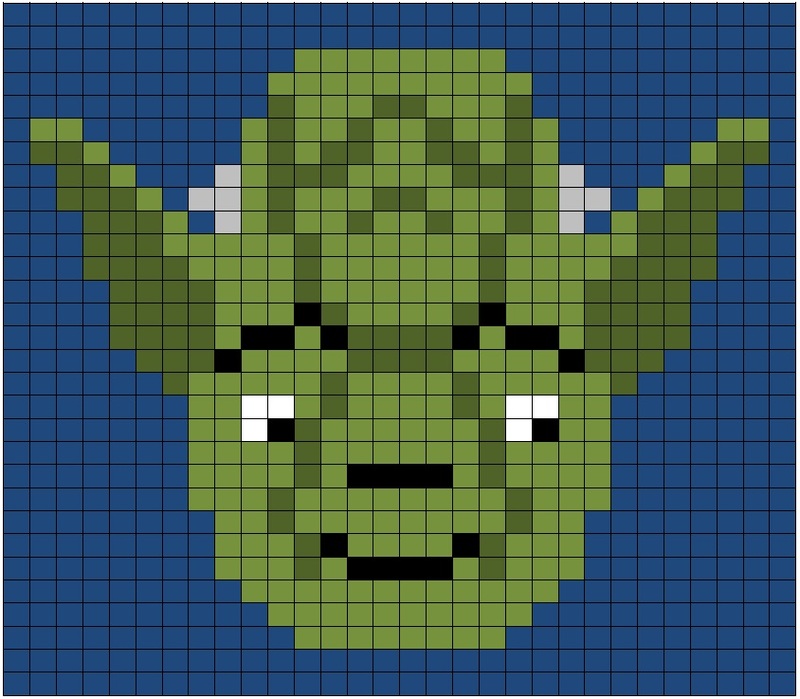 But the images of the squares you made from the patterns are super clean. Did you use different methods? Thanks for any tidbits you can provide! I started off using single crochet and it just looked a jumbled mess and quite frankly I was getting ticked off. So I ran to my office got out my Tunisian cable and started Tunisian stitch..omg so much neater crisper and faster. I love my Tunisia stitch. Everything else is the same size etc. 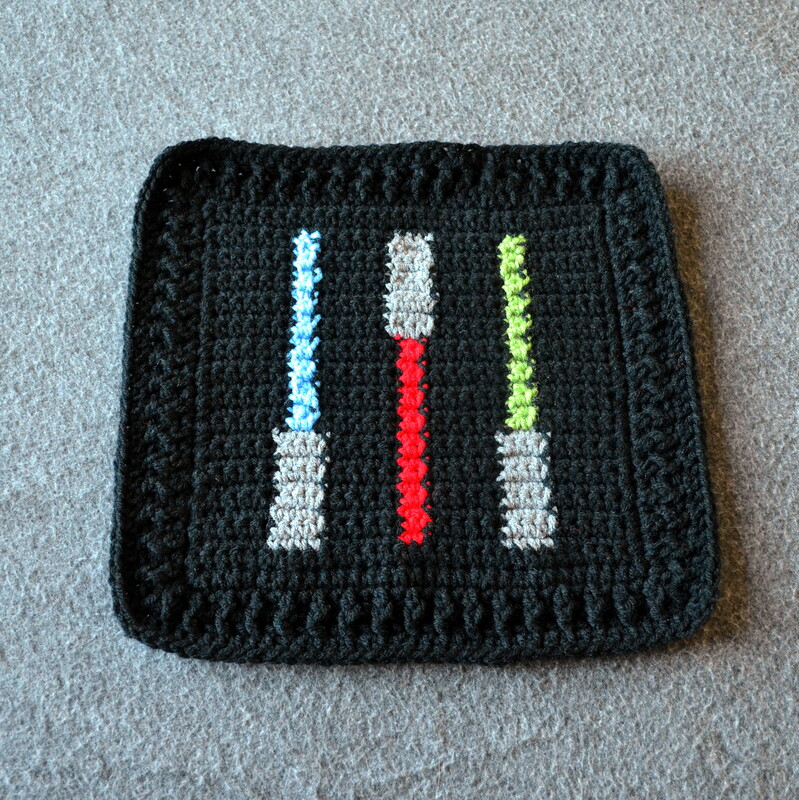 I am 21 squares done. Only desperately trying to create a Dooku pattern. Anyone have one? Thanks so much for the beginner’s video – it really helped me understand the front & back switching! Just wanted to say a huge thank you! 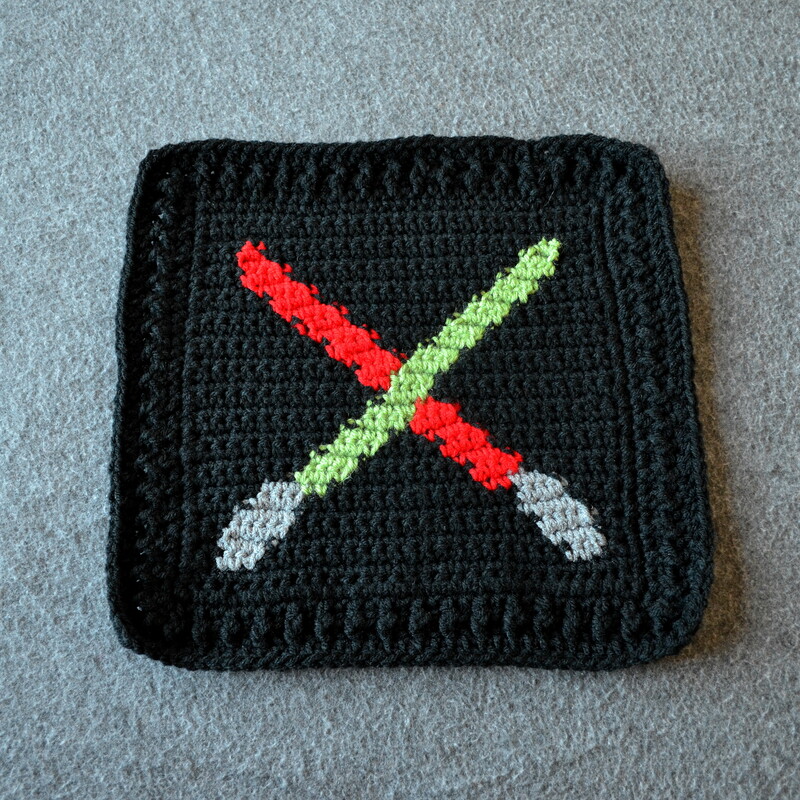 Awhile ago I started a Stormtrooper blanket for my now husband, but never finished it, and lost it in a move. 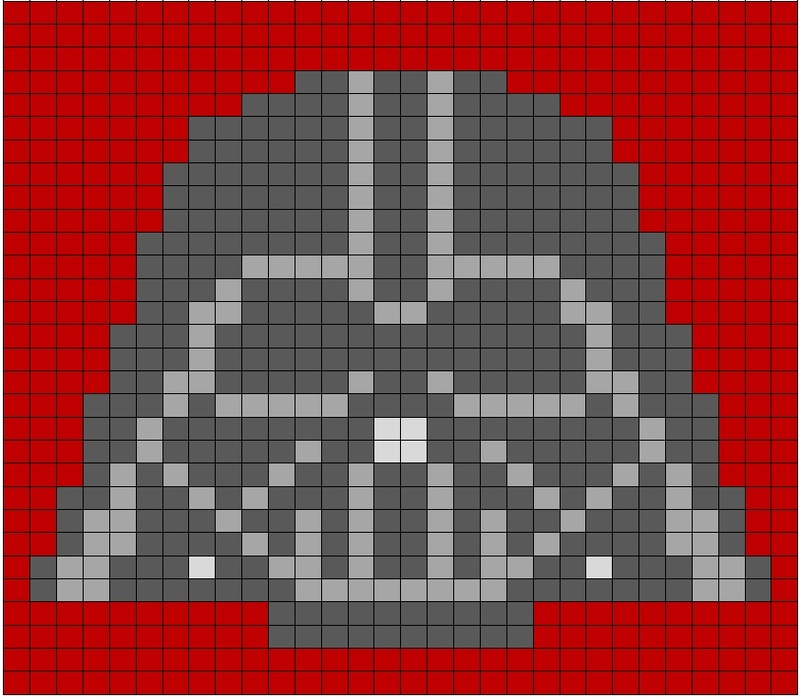 I think he would be thrilled to see it finished, thank you for supplying the squares!